Once Upon a Time has gotten off to an unfocused start in its second season. Now that the curse is broken, the drive of the first season has been sorely missing. Finally the fourth episode, “The Crocodile,” has offered a new goal: breaking the new curse. Okay, that’s not much of a stretch, but it is something. “Crocodile” further tells the sad and sordid story of Rumplestiltskin (Robert Carlyle). Stylistically it reminded me of what I liked so much about the first season. The backstory was interesting, the present (in Storybrooke) offered some mystery and intrigue, and overall it was entertaining. I can’t say the show is back on track entirely, but this episode was a big step in the right direction. Last week I complained that they were introducing too many new characters at the expense of diminishing the roles of established ones. 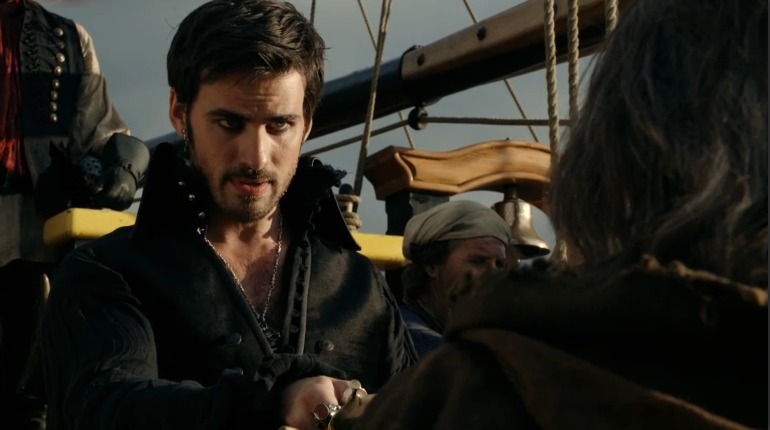 While I still feel that way, I thought they did a good job of introducing Captain Hook (Colin O’Donoghue) and integrating him into the storyline. It seems Captain Hook figures greatly into Rumple’s past and the two hold quite a grudge against each other. I wasn’t expecting Captain Hook to so cleverly figure in, so it was a pleasant surprise to watch the story unfold. At the same time the present Rumple/Mr. 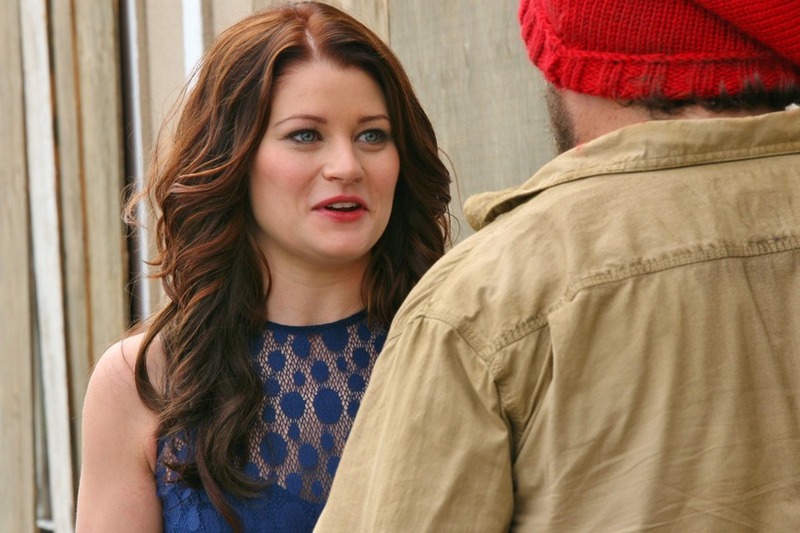 Gold is torn over his love for Belle (Emilie de Ravin). I thought the episode did a good job of showing Rumple’s affection for Belle, while not compromising the conniving side of his character. I would hate for Rumple to lose part of what makes him so entertaining. His conflict with himself is what makes him so intriguing. Most of the other characters were absent from the show. Regina (Lana Parrilla) was nowhere to be seen. Snow (Ginnifer Goodwin) and Emma (Jennifer Morrison) were also not shown. Prince Charming (Josh Dallas) got a little more screen time as he joined the dwarves down in the mines and also helped Rumple look for the missing Belle. We also saw a little more of Ruby (Meghan Ory) as well. Her appearance left me wondering if she will turn into a werewolf again at some point. 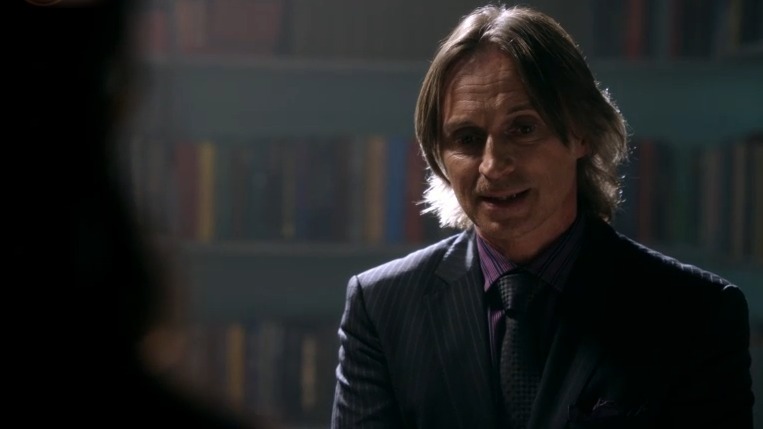 Who knows what Rumple’s tinkerings with magic will bring (not to mention Regina’s newly found powers). Clearly it’s difficult to juggle so many characters, which has resulted in episodes dealing with individual storylines one at a time. One character left out in the cold is Henry (Jared Gilmore). Last season he was the hub that everything revolved around. He was always consulting his book, kind of tying things together with it. His job was to convince everyone of the truth. Now he doesn’t really have anything to do. I still wonder how he fits into the overall story arc. Does his father have to do with anything? I hope they come back to his story. There is still the mystery man from the first episode we don’t know anything about. And whatever happened to Pinocchio (Eion Bailey)? There are a lot of questions to be answered on Once Upon a Time. I’m afraid some may fall by the wayside, but I’m hoping a clearer story starts to emerge very soon. This episode was highly enjoyable. Robert Carlyle is always excellent. I hope he continues to be featured prominently as the season progresses. After all, it is his curse. His motives pretty much drive everything. He wants to find his son, and he doesn’t seem to want to let anything stop him. The teaser at the end indicated Captain Hook is coming for him, so things could get pretty interesting in a hurry.